One Stop Tracking is a fitment centre for Tracker based in Robertsham and established in 2006. All of our technicians are Tracker approved. We pride ourselves on excellent and friendly service to all our companies no matter how big or small. We are an in house as well as a mobile fitment centre, so we can cater for all needs (in house fitments cannot be done on Trucks as we cannot fit it in the workshop, size up to a Mercedes Sprinter). So if you would like to bring the vehicle in to our facility to run away from everyone for 2 hours or if, like most people, you have a really hectic lifestyle and can’t afford to go out of the office, we can come to you at the location of your choice and do the fitment to your convenience. We are a 24 hour fitment centre so if your vehicles are only available at night, it's no problem for us to fit then, thus you don't lose out on any business time. We are the only Fitment Centre that runs 24 hours, 7 days a week, 365 days a year and in doing so we can make ourselves available to our clients at any time they are in need. Our technicians have up to 13 years experience in the Tracker industry. Our head technicians are qualified as a Motor Mechanic and Auto Electrician. Our technicians are supervised on a regular basis by a Tracker quality supervisor to ensure a high standard for fitments are kept at all times. All Techs are sent for regular polygraphs to ensure a trustworthy work force. Our 24 hour control room is there for vehicle monitoring and all the members working in that section have been trained to detect stressed driving patterns and out of habit driving. We have regular shifts to prevent any one person being over exhorted at any time meaning that they are alert and focused at all times. 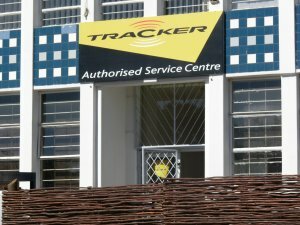 The reason we have chosen to be a part of Tracker is, because they have been the leading Tracking company since the 1990’s and they have a formal partnership with the SAPS, this means that in the event your car gets stolen and has been fitted with a Tracker device, you will have Trackers full arsenal of 1300 vehicles and 50 aircrafts capable of looking for your vehicle. Tracker also has the highest recovery rate from all the other Tracking companies, thanks to the conjunction they have with the SAPS. Tracker does not charge for recovery.